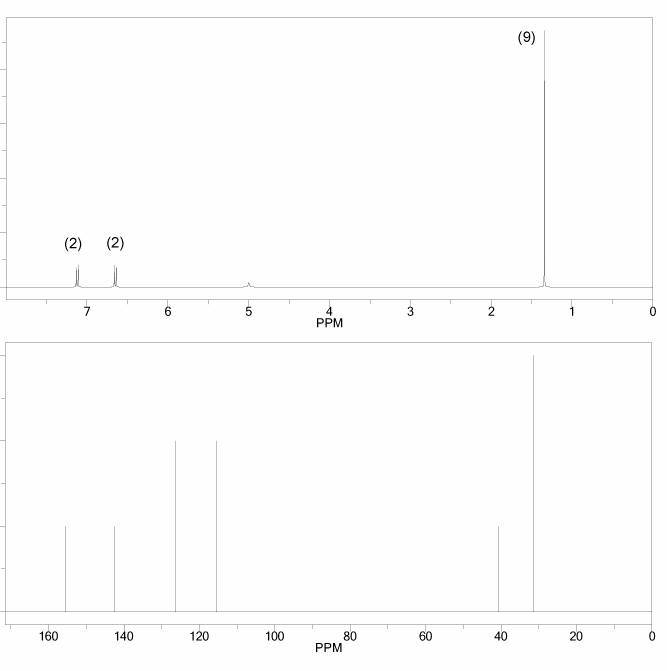 The 1H and 13C NMR spectra of a compound with chemical formula C10H14O are shown below. The compound's IR spectrum shows a broad peak at 3,300 cm-1. Determine the structure of this compound. Let's go through the steps you should take to solve any NMR structure elucidation problem. Yes. A broad IR peak around 3,300 cm-1 tells you this compound contains an alcohol. The formula is C10H14O. That's the same as C10H14 (oxygens don't change IHD count). A fully saturated compound has formula CnH2n+2, so a C10 molecule should have 22 hydrogens (2 x 10 + 2). The difference between C10H22 and C10H14 is 8 hydrogens, which corresponds to 4 IHD. 3. Draw some C10H14O structures with 4 IHD and eliminate, learn, repeat. This isn't shown on the image below, but if you don't have an idea of the structure of the molecule, just start drawing structures! Never look at a blank page- just start drawing structures with the correct number of IHD (in this case, 4 IHD). Eliminate by number of signals: Do the candidate structures you drew give the proper number of 1H and 13C NMR signals? If not, eliminate! Eliminate by multiplicity: Do your structures have the correct 1H NMR multiplicities? If not, eliminate! Eliminate by integration: Do your structures have the correct 1H NMR integrations?If not, eliminate! Eliminate by chemical shifts: Would the structures you drew have chemical shifts that are about the same as the chemical shifts in the 1H spectrum given in the problem? That's the order in which I usually eliminate candidate structures- fastest method (determining the number of expected NMR signals) to slowest method (predicting chemical shifts). Form the IR we know It contains an alcohol. The total integration of the aromatic region (~7 ppm) is 4, which means this molecule is disubstituted benzene. They're both doublets with integration of 2 which points to a para-substitution pattern. As you elminate incorrect structures you will learn what fits the data, and be able to draw better candidate structures. Then you can repeat this process. Once you have a structure that passes these four problems, you probably have the correct structure. 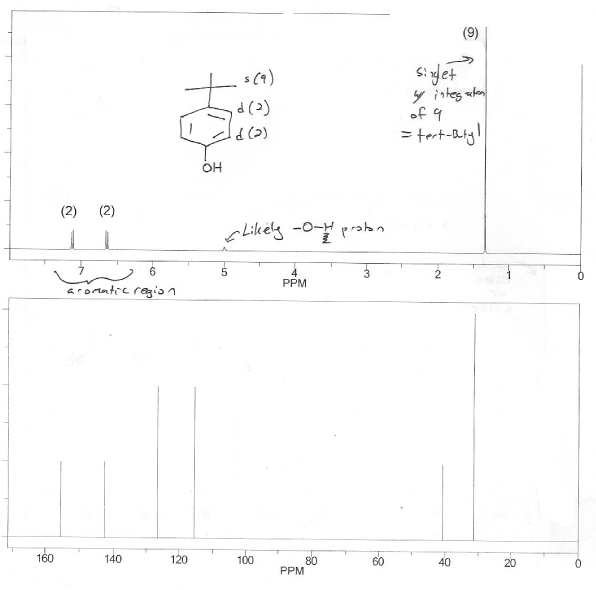 Notice how we didn't even really need the 13C NMR to answer this problem. The 1H NMR is usually enough. I can't stress how important it is to just draw something! Even if you have no idea what the answer might be, don't even leave a blank page for an NMR problem. Just starting drawing out structures with the proper formula and IHD count! MendelSet practice problem # 662 submitted by Matt on July 17, 2011.